The US Department of Labor announced yesterday that information about injuries and illnesses suffered by employees in certain high hazard industries will now be made publicly available, analogizing this to the requirement that restaurant safety grades be posted where the public can see them. The increased transparency is welcome news for worker safety advocates in North Carolina, who last year criticized NC OSHA for not accurately reporting the number of worker fatalities in North Carolina. At a Worker Memorial Day observance in Raleigh last month, attendees asked the Department of Labor to increase its commitment to worker safety on the job. 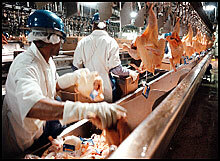 Oxfam America also issued a follow-up report on the poultry industry earlier this week, highlighting the need for OSHA to ensure workers have access to bathroom breaks. Unfortunately, the House budget, released yesterday, calls for the elimination of two OSHA safety compliance positions, which inexplicably have been vacant for more than two years.